Our team has been implementing employee research for over 20 years. Our clients range from multinationals to SMEs and not-for-profits to the NHS and other public sector organisations. We understand what makes people tick. We know the right methods to engage with employees, and we know how to interpret data to give you meaningful results. We have the skills and technology to manage staff surveys from 30 to 300,000 employees. Our surveys are regularly translated into many different languages. Our surveys also take into account cultural differences. We provide our clients with research that ensures true and insightful data. Our surveys consistently gain response rates in the region of 84%. Thanks to our representative response rates you can rest assured that your employee voice is being heard and understood. Employee engagement is a workplace approach offering the right conditions for all members of an organisation to give their best each day. Employees are committed to their organisation’s goals and values and motivated to contribute to organisational success. Employee engagement is based on trust, integrity, two way commitment and communication between an organisation and its members. It is an approach that increases the chances of business success, contributing to organisational and individual performance, productivity and well-being. It can be measured. It varies from poor to great. It can be nurtured and dramatically increased; it can be lost and thrown away. Engaged employees give you the edge in an increasingly competitive marketplace. Engaged employees are a valuable asset, they’re more productive, take fewer days off sick and go that extra mile. In an ever-changing world it’s vital to gauge how motivated your staff are on a regular basis. Disengaged employees are a negative force within any organisation and can adversely effect productivity and staff morale. They can halt the creation of fresh ideas, drive top talent away and have a damaging impact on your bottom line. Giving employees autonomy to make decisions can kick-start a more creative and entrepreneurial approach to your business. Employee empowerment enables staff to make decisions, develop solutions, find better ways of working and take ownership of their outputs. Our 360-degree feedback surveys don’t just deliver results for the individual we also take a strategic look at the organisation for our clients. Here we create benchmark reports for teams, departments, divisions and the organisation. 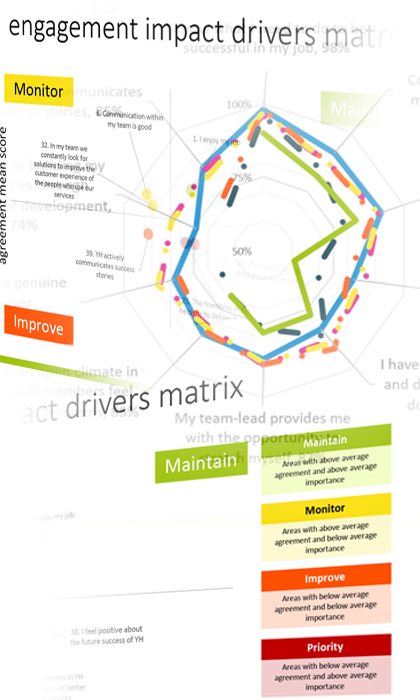 A Joiners Survey is an effective tool to assess the employee experience for new starters. A Leavers Survey enables you to understand why your people are leaving. A Pulse Survey is a short, regular highly-focused survey. It’s an ideal tool to track and measure engagement, or to understand if change is having the desired effect. We’ve developed bespoke Health, Safety and Wellbeing surveys for a wide range of companies. Our team of experts can offer insight, context and advice on how to improve your Health, Safety and Wellbeing. Our team of experts create bespoke Internal Customer Surveys to give you insight and the ability to develop your employee experience. We’ll also enable you to run a ‘tighter ship’ and offer improved service levels, decreased workloads and higher levels of employee engagement. 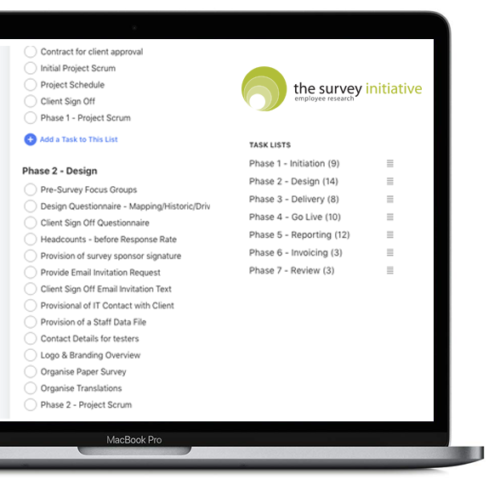 Our bespoke Ad Hoc Surveys are created by our team of experts to enable you to understand the thoughts and minds of employees. We’ll give you an insight into what’s going on in your organisation to enable you to make a positive change. Rest assured with The Survey Initiative you will receive dedicated client management. You’ll be introduced to your project manager and they will be on-hand to offer telephone and email support. We will guide you through your employeeresearch from brief to delivery of results. Your dedicated team is always here to support you through your employee research. We have invested in robust technology to be able to provide you with reliable data that can be customised to meet your needs. We’ve been running employee engagement research for over 20 years. We understand what makes people tick. Our senior management team consists of ex-Board level HR strategists, HR psychologists, employee research specialists and project management experts. We’re passionate about delivering the most effective employee research data and analysis to help you implement positive change in your workplace. Our team comprises of skilled HR practitioners, coaches, psychologists and facilitators. We can offer expertise in all HR areas to hone in on issues effecting your workplace. Our practitioners are experienced and understand the HR world inside out. We know how to consult with staff to get to the heart of the matter, and we deliver the information you need to move your business forward.